Jamie has already opened our eyes to the truth this weekend, with an old Joan Peters interview which reminds us to be more careful when considering sources and evidence. Well quite. Following this, I thought i’d post this Alan Dershowitz interview from earlier this year, which warns against the anti-Israeli bigotry of Jimmy Carter, and consigns to the hard-left anyone who doesn’t subscribe to the ‘universal admiration’ of Yithzak Rabin. See the pathway, my friends. Dion Nissenbaum, on the relative impunity enjoyed by Israeli soldiers in the territories, is well worth reading. Also, check out Steve Clemons’ interview with Mustafa Barghouti. On Obama he unfortunately pulls his punches, but his statistics and observations on the post-Annapolis environment are crucial. “What happened since Annapolis is really shocking. Since Annapolis, the rate at which Israeli settlements expand in the West Bank is twenty times more than before. 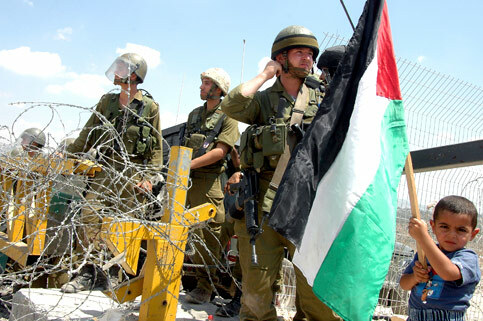 Since Annapolis, the number of Israeli military checkpoints have increased from 521 to 607. There’s a pretty good little article in this week’s Economist, which describes the actions of some Israelis who work against the occupation their country is imposing upon the Palestinians. I’m doing a little research on this during the summer, so there’ll be more on this soon, but for now I want to draw out the part of the article which concentrates on the legal challenges which are being made against the pathway of Israel’s wall. 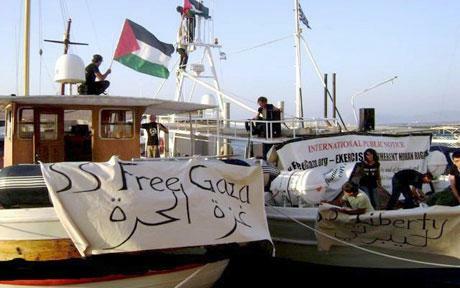 The focus of the article is on the activist group Peace Now, who represent what could be called the moderate wing of Israeli activism; more radical groups such as Gush Shalom and the Anarchists Against the Wall are ignored. This is a shame, because the tension between the methods and motives of the two groups are worth discussing (although it should be noted that this tension does not negate the fact that both types of groups make valuable contributions to the resistance). At Marxism, Eyal Weizman led an interesting tactical discussion about whether or not the small and genuine gains made by legal challenges of the type Peace Now propose are worth the resulting legitimisation of Israel’s occupation. Whilst a successful court battle against the pathway of the wall might win villagers in the West Bank some of their land back, it may also serve to provide a humanitarian facade which strengthens the popular myth that Israel tries hard to balance the need for security with some ‘concern’ for the Palestinians, and thus give ammunition to those who envisage the wall as a permanent feature of the Israeli countryside. The victories which have been won in court have been hard fought. 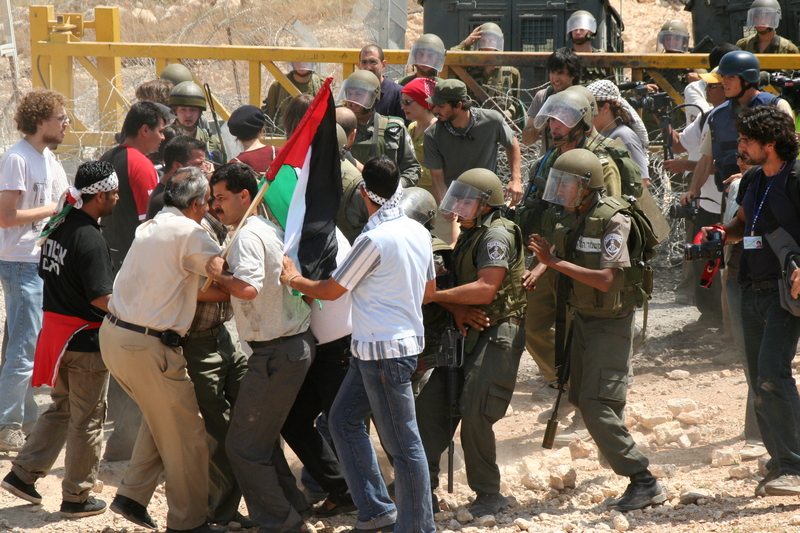 In Bil’in, activists struggled for years to win back even a small portion of their land from the snaking pathway of the barrier, and, as I have argued elsewhere, they managed to do so through both determination and use of the moral high ground. Weizman flippantly dismissed the example of Bil’in as a success, on the grounds that they had ‘only’ got 1.7 kilometers of their land back. This attitude is a little too pessimistic in my view – when you count that amount of land in terms of the number of olive trees and fields, and consider the unprecedented nature of this and similar judgments, it should not be ignored. However it is right to regard the development as insignificant compared to what the Palestinians are justly owed. There is then the uncomfortable need for consequentialist maths. In Peace Now’s route (tactic A) we have small victories, more certain, which may win tangible gains for the Palestinians – gains which can be measured in terms of trees and land and water. In a route which denies this legalistic perspective and refuses to engage in court battles (tactic B), victory is far less certain, but the end-point is the end of occupation, not the modification of occupation. At first glance it may seem that tactic A and B should be used together. Whilst the long-run view should be the end of the occupation (the form this should take is a separate discussion), in the short term it seems reasonable to argue that we should push for small gains and alleviate the suffering of the Palestinians. The problem is that, as mentioned above, employing tactic A may make the long-run goals less achievable. Supporters of Israel such as Alan Dershowitz claim that Israel is special because it struggles and suffers to ensure that the humanitarian concerns of the Palestinians are met. Human Rights organisations rightly note that these claims are false, however in the all-important media war, small concessions on the part of the Israeli government play very well. 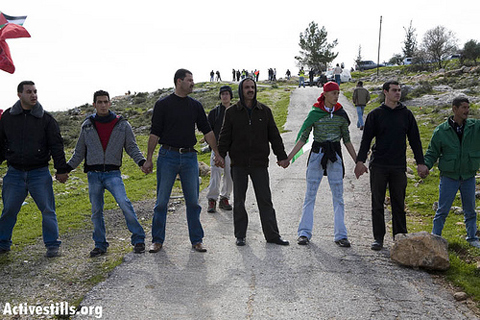 Victories also help to calm the protesting population – the weekly demonstrations at Bil’in have subsided since the ruling in their favour last September, despite the fact that they still stand to loose a considerable portion of their land to the wall. This is not necessarily to say that the legal battles should be abandoned. The importance is to understand the potential trade-off, and to frame tactical discussions appropriately. How we should then proceed is a decision for the Palestinian activists, which we should respect and follow. It’s a classic dilemma – the short run versus the long run, likely small gains versus less likely large gains, collaboration and legitimisation versus stalemate and the moral high ground. For now, tactic A seems to be the order of the day. Only time will tell what this can achieve. The rocket attack on Sderot carried out by Islamic Jihad today puts pressure on the already fragile ceasefire between Hamas and Israel. 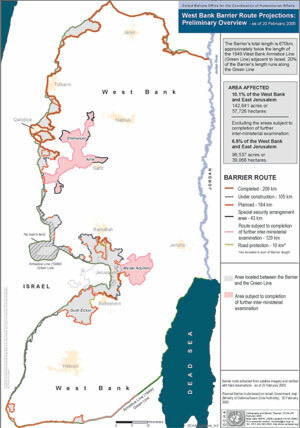 Most obviously it highlights the problems involved with the exclusion of the West Bank from the terms of the agreement; whilst Israel may want to divide the two territories, this is unrealistic and most likely an effort to further divide the Palestinians. More importantly, the reaction of Israel, who calls the rocket attack a “grave violation” of the ceasefire, hints at the fundamental power imbalance at work in any form of accord or agreement reached between the various parties. The extrajudicial killing of two Palestinians in the West Bank, whilst not formally in breach of any agreement, was likely to increase tensions in the region and make Hamas’s task of urging sceptical militant groups to refrain from rocket attacks almost impossible. There is no suggestion, however, that Israel breached the spirit and likely success of the ceasefire. Instead the rocket fire has been treated as unprovoked by Olmert and Barak, and their impending response is presented as a reasonable and necessary cautionary reaction. The power imbalance between the two sides, formalised through Oslo and accepted as uncontroversial ever since, has again given Israel the power to decide how the Palestinians should behave, whilst posturing to their hearts content with little regard for how events might spiral out of control. A response by Israel may be legitimate on paper, but in the context of searching for peace, it would be obscene. Negotiating with Hamas, whilst somewhat overdue, was the right move by Israel. It remains to be seen whether such negotiation was merely an opportunity to seize the first (and inevitable) breach of this ceasefire as a pretext for the major operation which the IDF has apparently been pushing for into Gaza. Such a situation would be reminiscent of the 1982 invasion of Lebanon. We can only hope that this is not the case.